1 Process first 7 ingredients in a blender or food processor until smooth. Remove 1 tablespoon of mixture and combine with Mayonnaise. Refrigerate until ready to use. 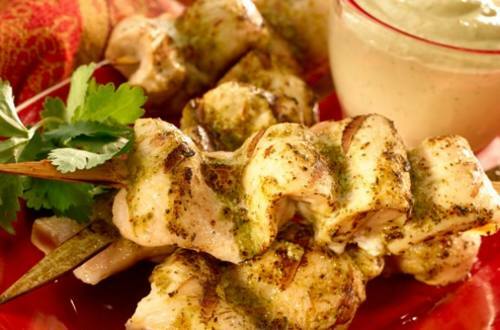 2 Thread chicken onto 8 skewers and arrange in a large nonaluminum baking dish; rub with remaining olive oil mixture. Cover and marinate in refrigerator about 30 minutes. 3 Grill or broil chicken about 6 minutes or until chicken is thoroughly cooked, turning once. Serve with mayonnaise dipping sauce.